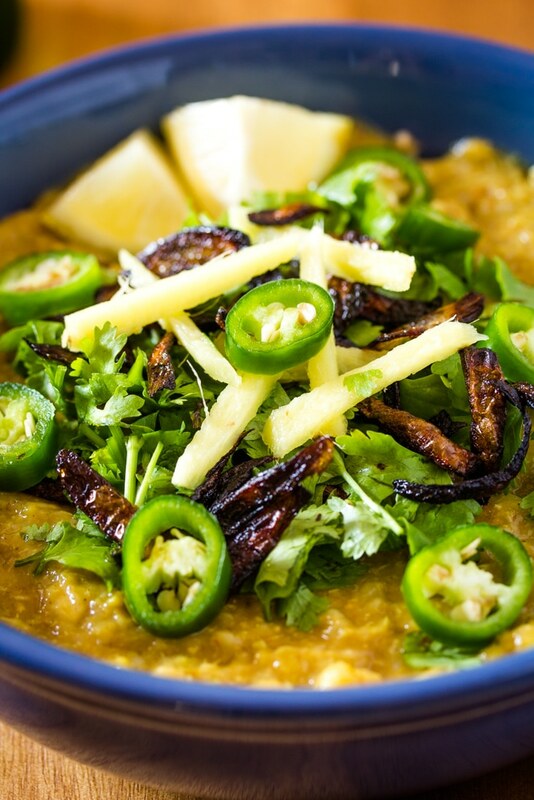 Haleem is a delicious and filling Arabic stew typically made with a variety of barley or wheat, lentils and meat. It’s a popular recipe in the Middle East, Central Asia and Indian Subcontinent. It’s particularly popular during the month of Ramadan. 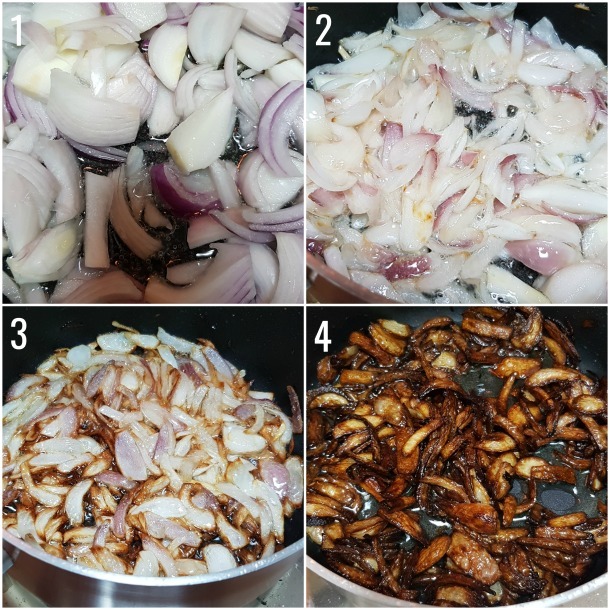 Learn how to make delicious chicken haleem through my step by step guide with pictures. 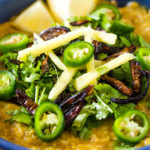 If you like these Indian and Pakistani recipes for Daal: Indian Yellow Lentils, Chicken Manchurian and Indian Chicken Korma, you’ll surely love this lip smackingly good Haleem too! Hiiiii! 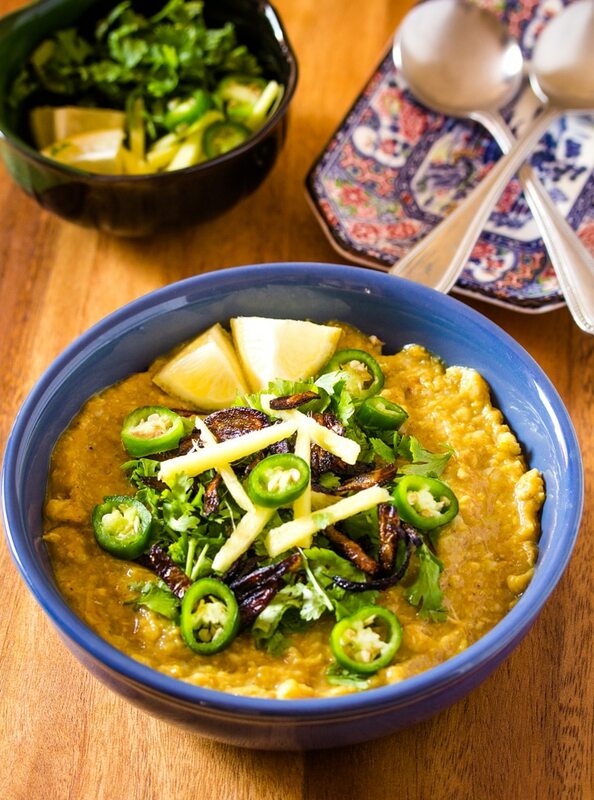 So I’ve been thinking for weeks now of posting a recipe for Haleem. Haleem is a super popular slow cooked stew in the subcontinent (Pakistan and India) but it actually originates from the Middle East. 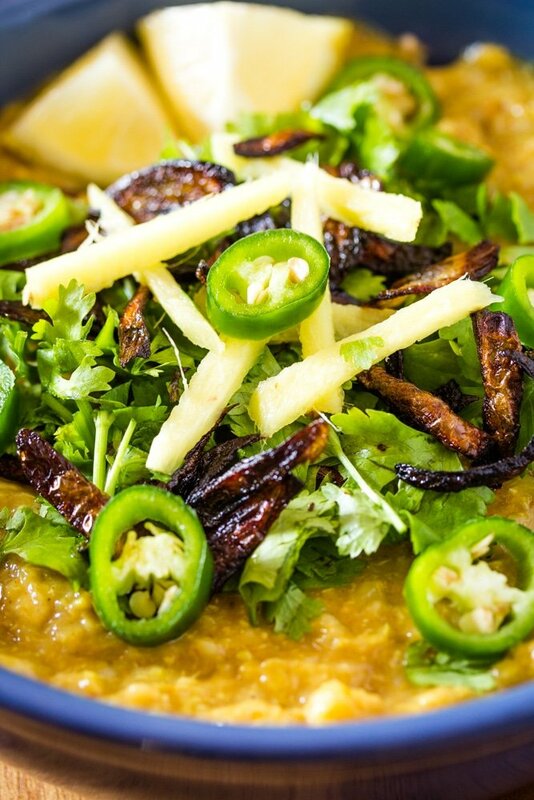 Hyderabadi haleem is particularly popular in the subcontinent. And with a few tricks that I’m going to teach you today, it’ll be even easier. 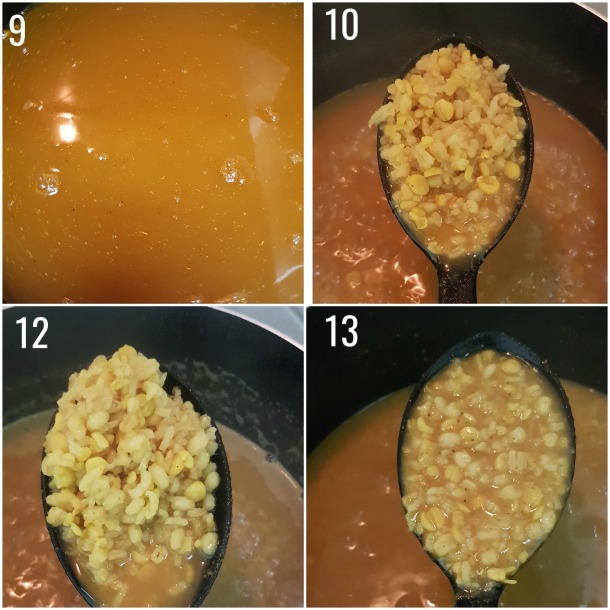 I’ve added step by step photos so that it’s easier for you to follow the recipe. What is Haleem Made of? Haleem is a hearty and delicious slow cooked stew which is almost always typically made with mix of barley, lentils, rice and meat. Typically, mutton, lamb or chicken is used as the meat in haleem. The recipe that I’m sharing today is Chicken Haleem and is very popular in Pakistan. Is Haleem Good for Health? 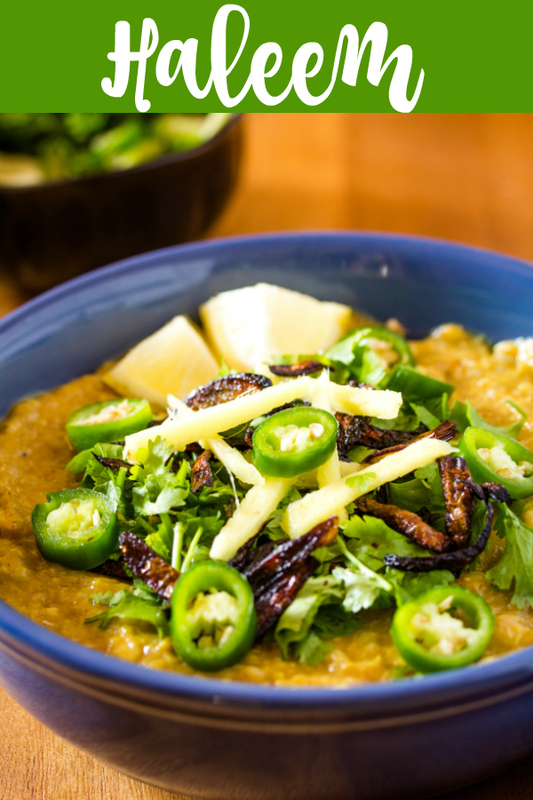 Haleem is a great healthy dish because it uses a variety of lentils and meat. It’s a filling dish that’s usually eaten on its own or can be eaten with naan. What is Haleem Served with? 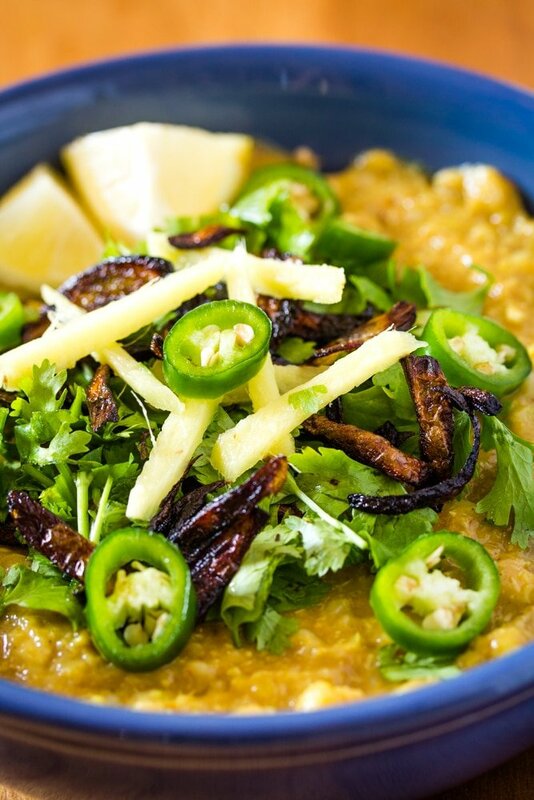 Haleem is usually topped with a variety of toppings such as fried caramelized onions, thinly sliced ginger, green chillies and chopped coriander. With a squeeze of lemon juice it can be simply eaten with a spoon. But in Pakistan it’s almost always eaten with naan and it’s super delicious. So I’ve adjusted the recipe so that the time is narrowed down to about 3 hours (1 hour of which involves just soaking the lentils in water). I know it’s till pretty long, but honestly most of it just involves stirring around and you can scroll through Instagram (ahem, I mean look after the kids) while the haleem is cooking away. 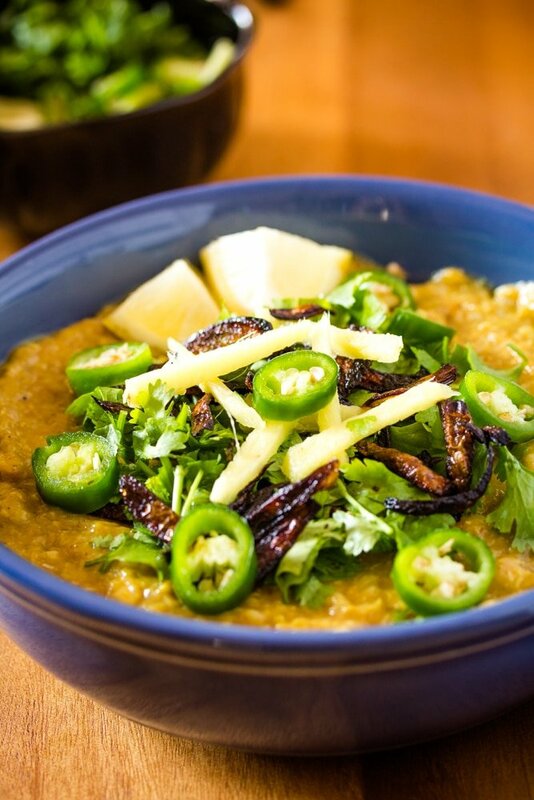 So how do I make Haleem the easy way? 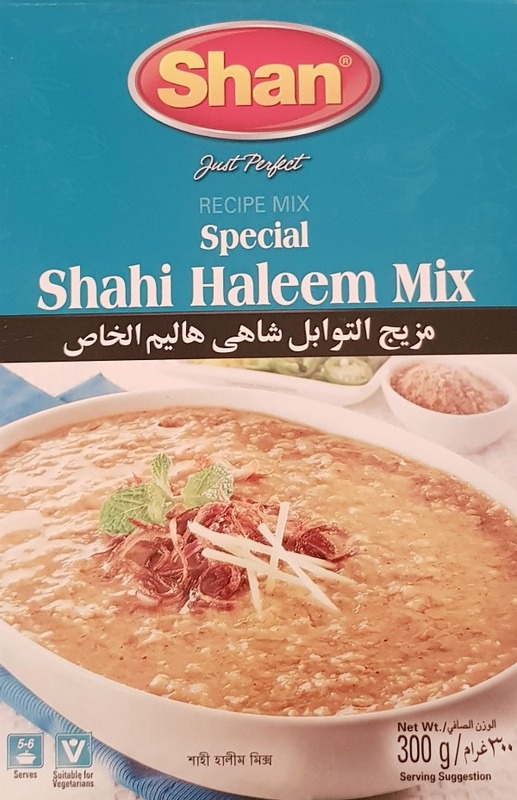 Enter Shan Shahi Haleem mix. It’s a complete pack which comes with the lentils (including the barley & wheat) and the spice mix. The spice mix basically contains all the spices you need for making haleem. Now the suggested recipe for Haleem is written on the back of the box. I’ve made a few changes to it though. The lentils mix needs to be soaked for about 1-2 hours in water. I also add a handful of each to the lentils mix: rice, yellow split lentils, and red split lentils. This is completely optional, so you can just stick to the lentils mix that’s provided with box if that’s easier. So start by soaking the lentils. The day I have to make haleem, I usually soak the lentils as soon as I wake up, and by the time I’m done with the morning routine of breakfast and cleaning up, the lentils are ready to be cooked. Below is a picture of the lentils mix that has been soaked for 2 hours in water. I’ve drained the water. You can use any meat such as beef, mutton or chicken. I prefer chicken so that’s what I used. It also cooks quicker. If you use beef or mutton, the cooking time will vary and be typically longer than it takes with chicken. Start by frying sliced onions in a little bit of oil, until they’re a light golden brown. Then add boneless chicken pieces and cook for a few seconds until they start to change color. Add HALF of the spice mix (from the Shan Shahi Haleem pack) and cook the chicken for about 5-7 minutes until the oil separates. Then add the tomatoes and a little bit of water. Lower the heat and cover the pot. Cook for about 15 minutes or so, until the tomatoes have softened and cooked through. Transfer the chicken masala from the pot to a bowl, and set aside. Now, in the same pot, add the soaked lentils (without the water in which they were soaked) and 12 cups of water, and the rest of the Shan Shahi Haleem spice mix. Cook for about 1 hour on medium high heat. Keep stirring every ten minutes or so. The lentils and barely are ready when they’re cooked through. Once the lentils & barely have cooked completely, add the chicken masala. The last step is to blend the haleem. Now haleem is not supposed to be completely blended into a smooth paste, it’s supposed to have some texture. You can either use a blender or a hand blender. I used a hand blender because it’s easier. If you’re using a blender, make sure that the haleem is cooled down a bit before blending it. Also, if using a blender, you will have to blend the haleem in batches. Only one or two pulses of blending for each batch of haleem is enough. It’s easy to make caramelized onions. Just fry thinly sliced onions in a bit of oil (keeping the heat medium) and keep stirring until a deep golden brown. It’s important not to leave the stove while doing this, because onions go from golden to deep brown to burnt really fast. So leave the instagram scrolling for later. HAHA. And to ensure even frying, you need to keep stirring it after every few minutes or so. Once the caramelized onions are fried, spread them on kitchen paper to soak the excess oil. Now top the haleem with caramelized onions, ginger, coriander and chillies and a squeeze of lemon juice. And enjoy! Haleem is always made in big batches and this recipe also makes a big pot. So it’s important to know how to store it. Also, haleem is one of those delicious recipes which become even more delicious over a couple of days after it’s been cooked. Haleem can be stored in the refrigerator for unto 3 days in an airtight container. If you want to store haleem further than 3 days, then it can be frozen up to 1 month in an airtight container. When ready to eat the haleem, just let it thaw at room temperature or gently defrost it in the microwave. Once thawed, it can be heated in a pot on the stove. 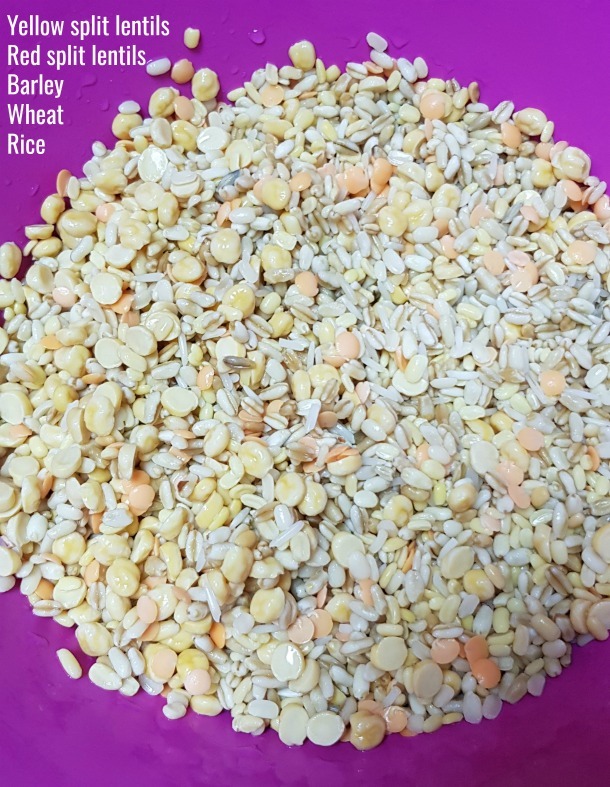 Soak the lentil mix provided in the Shan Shahi Haleem Mix and also additional rice and lentils in a medium bowl for 2 hours. Drain the excess water, and set aside. Fry the onions in the oil in a large pot, until they’re golden brown. Add the chicken and cook for about 1 minute until it starts to change colour, and then add the haleem spice mix or masala. And cook for 3-4 minutes on high heat, until the oil separates. This step is called bhoon-na. Add the tomatoes and cook them for 2-3 minutes on high heat. Add 1/3 cup water and lower the heat, and cover the pot. Let the tomatoes cook for about 15 minutes until they have softened (refer to the step by step photos). 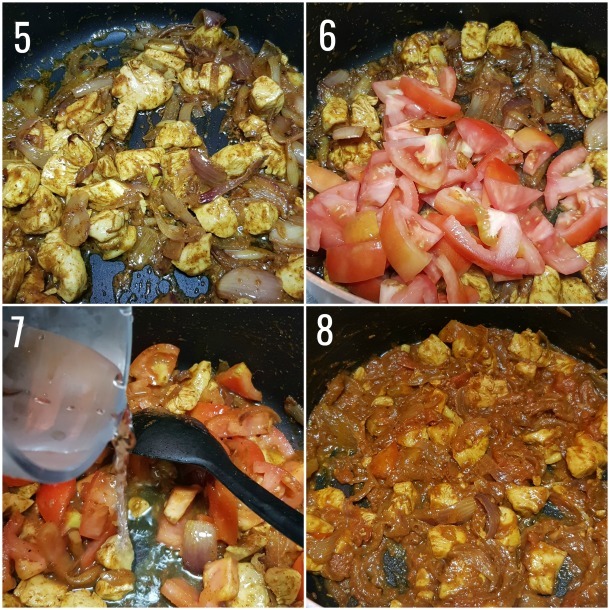 Transfer the chicken masala to a bowl, and set aside. In the same pot, add the lentils, the remaining spice mix and 12 cups of water. Cook on medium heat for about 1 hour, or until the lentils have cooked through. Keep stirring every 10 minutes or so, to ensure that the lentils don’t stick to the bottom of the pot. 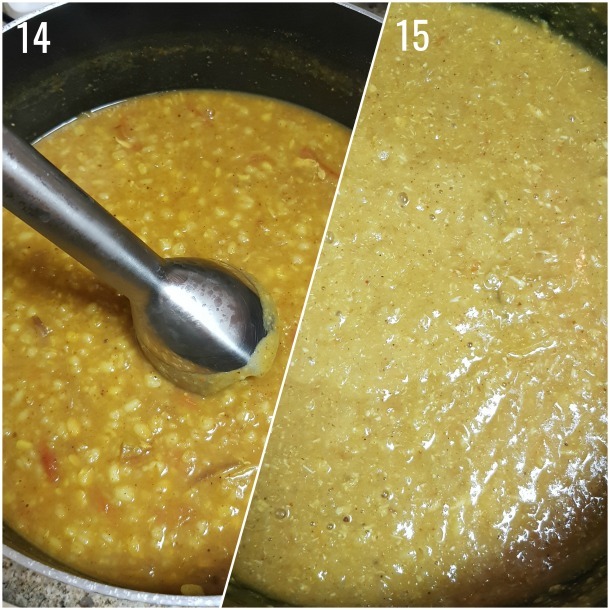 Refer to the step by step photos to see how the lentils look when they are cooked through. Add the chicken masala to the lentils, and using a hand blender, blend the haleem to your desired consistency. I like to blend it just so that there’s some texture still remaining. In a medium saucepan heat the oil on medium high. Add the sliced onions, and fry while stirring frequently. Fry the onions until they reach a deep golden brown colour. To avoid the onions burning, fry them on medium heat while continuously stirring. 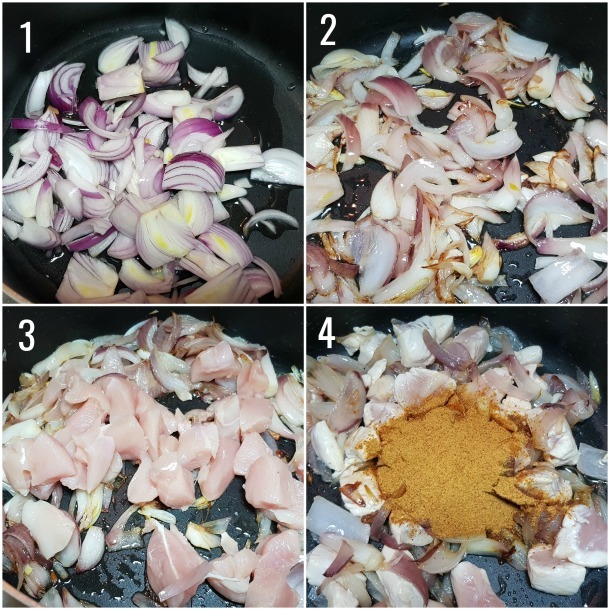 Refer to the step by step photos to see how the onions are fried. Garnish with fried onions, chopped coriander, green chillies and thinly sliced ginger. Serve with naan or pita.